Provide estimates of ozone benefits to human health & ecosystems for potential technological paths to emissions reductions which could achieve regulatory endpoints. 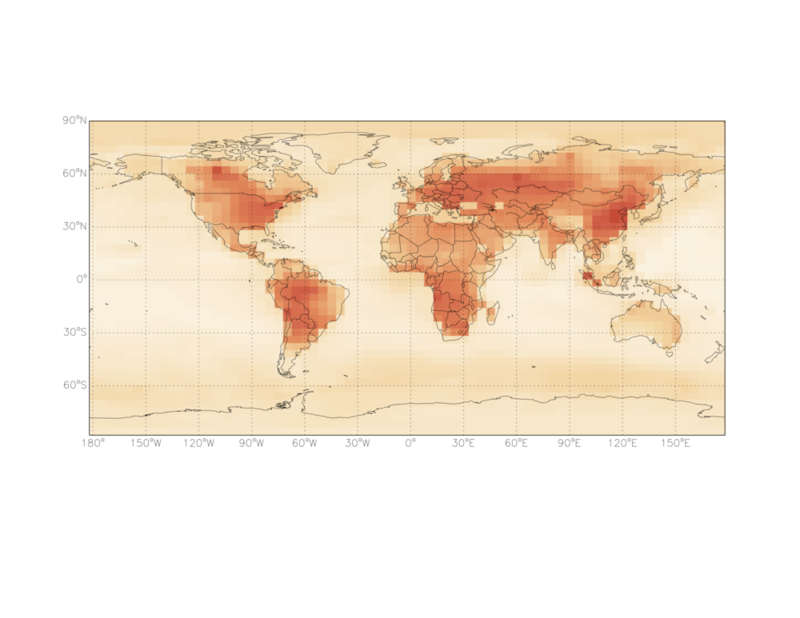 CMAQ adjoint driven by metrics that evaluate the harm to human health and the environment due to ozone exposure incurred in the US during the summer of 2012. Chronic exposure to ozone, often in cities, increases the risk of death from respiratory illness (Jerrett et al., 2009). Reduced yields of common crops and many trees result from exposure to high ozone levels over the growing season. Vegetation that serves varied animal populations in parks can be harmed by ozone, affecting interdependent systems. Change in 8-hr average ozone concentration with elimination of solvent-related VOC emissions. We quantified the downwind effects of substituting slowly reacting volatile organic compounds (VOCs) in paints and solvents in the Northeastern corridor by evaluating various emissions scenarios with the CMAQ model (Capps et al. 2010). Exchanging highly reactive VOCs for more slowly reacting ones based on a certain chemical scale reduced the ozone regulatory metric locally, without notable downwind increases. structure of Nenes & Seinfeld droplet activation parameterization augmented with adjoint sensitivity analysis. If you have ever breathed air filled with small particles, you probably know that humans respond to air loaded with lots of aerosol negatively. Clouds also change when concentrations of aerosol or, more specifically, cloud condensation nuclei (CCN) are nearby. Because cloud droplets form on aerosol, the number of CCN present at the base of the cloud affects the concentration of droplets in the cloud. Concentrations of cloud droplets largely determine how much light will reflect off the top of the cloud and how much will get through to the earth (or clouds) below. The connection of emissions to indirect radiative effects of aerosol is an aspect of the climate system about which scientists are more uncertain. By using computers and math to represent the chemical and physical transformations of gaseous and aerosol emissions in the atmosphere, we can evaluate the impacts that humans have on the reflectivity of clouds. To do so efficiently, though, sensitivity analysis tools like adjoints are excellent. We have developed the adjoint of the updated Nenes and Seinfeld droplet activation parameterization and applied it to the results of two global chemical transport models to understand the relationship of cloud formation parameters and aerosol droplet concentrations. For more details see the following articles. After incorporating the adjoint of ISORROPIA and the droplet adjoint in the GEOS-Chem adjoint framework, we seek to understand these effects in the coupled model.